What tools and methods do scientists use to collect data? We have described the ones we will be using below. Does it surprise you that sometimes scientists just use pencil and paper? How can you tell how many dolphins are in any given area? Researchers use a method called a residency scan. Is there anything special about the area we are observing that would attract dolphins? Is there a change in the number of dolphins in the area over the course of a day? Month? Season? Do both species of dolphins appear in equal numbers and at the same time or does one species dominate and if so is this related to the time of day? Lastly, what happens when humans enter the observation area? The areas were we will be doing residency scans are at the confluence of two rivers. Our first residency scan was at the confluence of the Yanayacu and Marañon rivers. Tamara has noticed over the course of her study that both species of dolphins tend to congregate in these areas. The reason why is still not known. 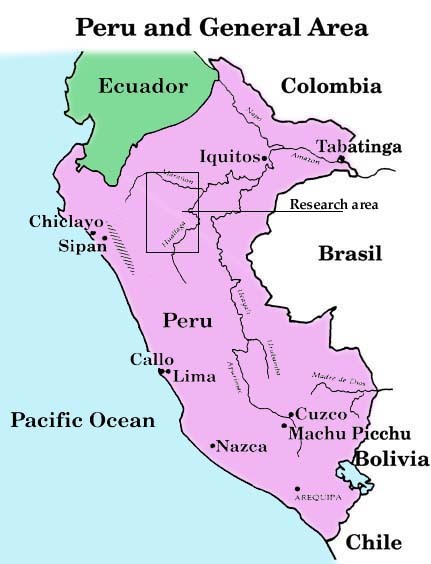 Yanayacu means "blackwater" in Quechua. There are three types of water found in the Amazon river basin. They are blackwater, whitewater, and clearwater. Blackwater is the run-off from the forest floor. Blackwater is sort of a natural "tea." It is dark in color because it contains tannic acid from all the plants in the forest. Whitewater is the nutrient-rich water which runs through the middle of the Amazon in the strong current and comes from high in the mountains. The water doesn't look white -- like rapids do -- but muddy. Clearwater is transparent but not particularly nutrient-rich. While it may seem simple to count animals in the wild, it requires a lot of patience and careful observation. We practiced for a few hours before we began the actual residency scans. To do the scans we work in teams of two for one-hour periods, and then we rotate teams. Each team of two people is responsible for observing one area of the river. Each team has a spotter and a recorder. The spotter calls out every time he or she sees a dolphin surface and whether or not it is a tucuxi or a boto. The recorder then writes down that information on a recording sheet. The hour is broken into five minutes segments. During each five minute segment we record the number of dolphins we see. Every five minutes we start our count over. Five minutes begins a new observation period. There are three questions we have to answer before we can write anything down on the recording sheet. The first is "Was it a dolphin that we really saw?" To determine this we must see the actual skin of the dolphin. We can't just see movement in the water and count it as a dolphin. If we are in doubt then we can't count it. The second question we must ask ourselves is "What kind of dolphin is it?" Our last question is "How many dolphins did we see?" Did we see one dolphin by itself moving around or different dolphins swimming in the same observation area? Clearly we can't count as one dolphin every time we see a dolphin surface. Dolphins swim around underwater, so we don't want to count the same dolphin more than once in any five minute period of time. When we see one surface we take a mental note and then watch the same general area to see if it comes up again. If it just moves to another location and surfaces, it still only counts as one dolphin. We also have to keep in contact with the team on the other side of the boat so that if one dolphin moves out of our area and into the other team's, both groups don't count the same dolphin. This all seems easy except the water is muddy and the dolphins don't surface for very long periods of time. Sometimes we only hear them snort or see the ripples on the water. Before we begin, each team records on their data sheet the date, location of the observation, their names, the platform (in most cases it is the Delfin -- our boat), our position ( either on the right or left side of the boat), and the weather condition. We also include the wind speed in the weather description and use the wind indicator to do so. Today's data in on the Daily Data page. After the day's work is over, Tamara puts the information into an Excel graph. The transect method is similar to the residency scan. However, this method looks at the total number of dolphins in a given area and where they are located in the river or lake. The residency scan on the other hand, looks at the frequency of dolphins over a period of time to determine their movement patterns. Tamara always does the transects in the same places and she tries to do them at the same time of day each time. This way the location and time of day are consistent in her study. Unlike the residency scan, the transect requires that the boat continuously moves from one point in a body of water to another point. As the boat passes a dolphin, it is counted. Because the boat moves at a speed slightly faster than dolphins can swim and, because we only count dolphins along side of us, we never count the same dolphin twice. This methods allows Tamara to determine if the number of dolphins stays the same in the area over months and years, and if they have any preference for where they like to be in the river or lake. For example, do they prefer to be along the banks or out in the mid channel? She can also tell if there is a change in the numbers of each species in the area over time. Are there more or less total dolphins or of just one of the two species? We begin the transect by recording the exact position of the boat using the Global Positing Satellite or GPS as it is called. The GPS also records the boat speed and the time of day. The wind is recorded with the wind meter. Like the residency scan we work in teams of two for a one hour periods. However, a fifth person is needed for this method. Using the GPS, the fifth person sits in the middle of the boat deck and calls out the time and location of the boat each time one of the teams spots a dolphin. Each team then records that information along with the number of each species of dolphin spotted on their data sheets. It is important to have some standard measure of the weather when observing dolphins. When the wind picks up and/or it is raining hard, it becomes even more difficult too see dolphins. When Tamara looks at our data sheets,she needs to know if the reason we don't have any dolphins recorded is because the wind is making it difficult to see them. Or, are there just not any dolphins in the area. She uses a wind meter to get a reading of wind speed at the beginning of each observation. Over time she can compare wind speed to the frequency of dolphin sittings. Range Finder binoculars are used to determine the width of the river at any given location. The user takes a bearing on one bank by pushing the button on top of the binoculars which activates a laser. When the button is pushed again, the finder gives a readout of the distance from where the user is standing to the bearing on the river bank. We use the range finder binoculars to determine the width of the body of water we are in, and to practice judging distances when doing data collection. The laser beam doesn't accurately read the distance for objects in the water, so we have to estimate how far the dolphins are from the river banks. A GPS, as it is called, is a hand held device that communicates with at least 3 satellites simultaneously to determine an exact location on the earth in degrees longitude and latitude. It also can record the boat speed and gives us an accurate reading of the time of day. The GPS runs off a 12-volt battery or AA batteries. We use it to determine the location of the dolphins along side the boat in the transect. Special paper is used to measure the degree to which the river water is neutral, acidic or basic. The paper strip is placed in the water for only a moment after which it changes color. There is a chart that is used to compare the new color of the strip to in order to determine the PH. The numbers on the chart range from 1 to 10 with 1 being the most acidic and 10 being the most basic or alkaline. The temperature probe measures the temperature of the water. A sensor is lowered into the water and the temperature is read on the meter. Tamara takes the temperature at both the bottom and surface of the water. The depth indicator measures how deep the water is in meters. It has a sonic beam which bounces off the bottom of the river and back to the indicator, measuring the depth at that location. To use the meter, you place the end of the device on the very tip of the water and push a button which sends the sonic beam. It must be held vertically to get an accurate reading. The secchi disk measures the transparency or clarity of the water. It is a round disk attached to a long rope. The top of the disk is divided into four sections. Alternating sections are either white or black. The rope is marked off in 0.5 meter increments. The disk is lowered over the side until you can no longer tell the difference between the black and white sections of the disk. The disk is then taken out of the water and the water line on the rope indicates the depth to which the water is transparent.